The notion of unbordered picture generalizes to two dimensions the notion of unbordered (or bifix-free) string. 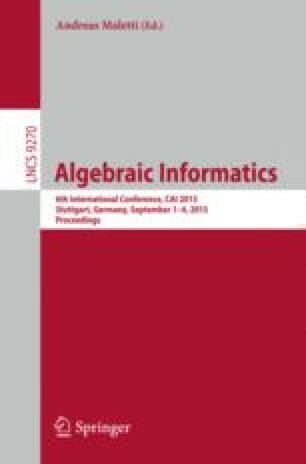 We extend to two dimensions Nielsen’s construction of unbordered strings () and describe an algorithm to construct the set U(m, n) of unbordered pictures of fixed size (m, n). The algorithm recursively computes the set of quasi-unbordered pictures Q(m, n), i.e. pictures that can possibly have some “large” borders. Partially supported by MIUR Projects “Formal Languages and Automata: Mathematical Structures and Applicative Directions” and “PRISMA PON04a2 A/F”, and by FARB Projects of University of Catania, Roma “Tor Vergata”, Salerno.